Back Street Soccer is a Korean street soccer arcade game released by SunA in 1996. One of 14 international teams can be selected. The game is played on the street with a 'street fighter' element to the soccer. Back Street Soccer was SunA's first and only sports title. 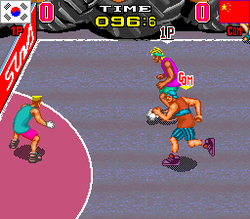 Characters' sprites are clearly ripped from a SNK Neo-Geo MVS game called "Street Hoop", a basketball game from Data East. The game's continue screen features pictures of world famous soccer players such as Diego Maradona, Jurgen Klinsmann and Roberto Baggio as backgrounds. The pictures also appeared when you complete the game. One of the music tracks in this game features voice samples from the console basketball game Jammit, such as 'Mama said knock you out!' and 'Time to bust yo grill, sucka! '.